Katie Mitchell’s acclaimed stage adaptation of Dr Seuss’s The Cat In The Hat will embark on its first UK tour in 2015, playing at the Grimsby Auditorium on Monday 31 August. From the moment his tall, red-and-white-striped hat appears around the door, Sally and her brother know that the cat in the hat is the funniest, most mischievous cat they have ever met. With the trickiest of tricks and craziest of ideas, he turns a rainy afternoon into an amazing adventure. But what will mum find when she gets home? Based on the much-loved book by Dr Seuss, The Cat in the Hat is a lively and engaging first theatre experience for young children aged 3+. The Cat in the Hat was first published in 1957 as Dr. Seuss’s second book for children. It marked the transition of Theodor Seuss Geisel from successful advertising executive and political cartoonist, to world-famous illustrator and children’s author. The curious and intricate rhyming found in The Cat in the Hat is still adored decades later with over 250 million copies sold worldwide in more than 20 different languages. 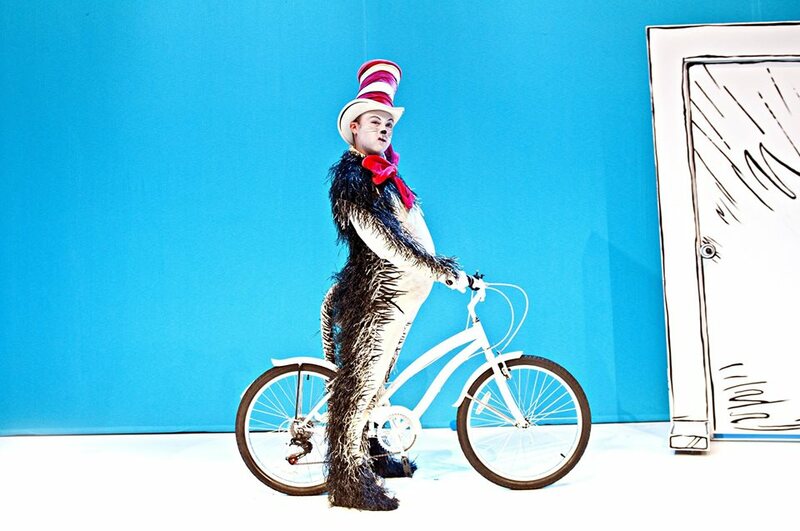 Katie Mitchell’s stage adaptation of The Cat in the Hat first played in the National Theatre’s Cottesloe Theatre in December 2009, before transferring to the Young Vic in 2010. SEUSS’ THE CAT IN THE HAT, based on the book by Dr. Seuss, was originally produced in 2009 by the National Theatre of Great Britain, and adapted and originally directed by Katie Mitchell. This new production is directed by Lillie Collier, designed by David Shields and produced by Paul Taylor-Mills Ltd. It is presented through special arrangement with Josef Weinberger Plays Ltd on behalf of Music Theatre International (MTI).